Advanced Product Quality Planning – Are you achieving market potential? Originally developed and documented as an ‘automotive standard’ in the late 1980s, Advanced Product Quality Planning (APQP) is today, equally applicable in any organisation that needs to manage the introduction of new products and processes to satisfy customer requirements. Excel announce that, as of the New Year 2015, Excel Partnership is combining its Management Systems training and consultancy businesses with Bywater Training. Faced with changing customer expectations and new market opportunities, the ability to respond by improving your products and processes becomes a critical success factor for your organisation. Without a disciplined approach to product and process development however, the technical and commercial risks of failure rise as product complexity increases. APQP provides the disciplined approach to the development of new products and production processes required to prevent poor product performance, programme delays and cost over-runs that destroy profitability. By reducing the risk of project failure while simultaneously accelerating the development process, APQP creates a competitive advantage - as users become more responsive to changing market conditions and are able to exploit new opportunities. The concepts of Lean Manufacturing, which continues to transform manufacturing industry to this day, were advanced by Womack1 and his colleagues whose research identified the critical success factors driving the most successful companies. Those familiar with Lean Manufacturing will appreciate that its success is counter-intuitive – and organisations must build a management culture that supports ‘lean thinking’ – to avoid creating bureaucratic empires. This challenge cannot be ignored in Lean Product Development because processes only add value when the information flows to (internal or external) decision makers, and poor decisions can have far reaching, and sometimes fatal, consequences elsewhere. Though often overlooked by traditional organisations, Lean Product Development enables companies to become more responsive to changing market requirements whilst avoiding the chaos, disruption and customer complaints caused by poorly executed ‘product and process improvements’. APQP enables organisations to move into lean product development by providing a stable process for creating and managing the development of new products and processes - without stifling creativity. Taichi Ohno, at Toyota, argued that you cannot start to improve a process until you have established standard and repeatable methods of work. So, in product development we need ‘standard processes’ that encourage creative thinking, whilst avoiding the unacceptable risk of design and process changes that are not fully validated. Information required to execute the process. The purpose of the process as a decision making tool. The information and documentation provided for use elsewhere in the process. 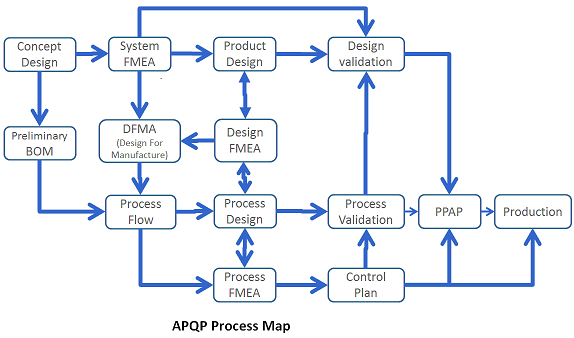 The APQP Process Map (below) shows the flow of information through development process and the relationships between the various sub-processes. For example, the Process FMEA, influences the production control plan, but requires knowledge of the process design and production process flow. In turn, Process Validation can only be performed when the process and production controls have been defined, and the Production Part Approval Process (PAPP) requires evidence of both design and process validation. The Valukas Report into ‘GM’s Ignition Switch Failures’ has shown that the failure to establish and maintain a disciplined approach to product development can seriously damage an organisation and its brand reputation. The report reveals that by 2002 GM had created bureaucratic empires, with barriers to communication between departments, accompanied by organisational silos paying lip service to the product development process. As a result, engineers developing the ignition switch did not understand the vehicle systems, or the interaction between the switch and other vehicle systems. Evidence of potential problems from development tests, captive field trails and press reports was dismissed as insignificant, and a dangerous and defective product reached production – causing at least 69 deaths. The GM Ignition Switch saga demonstrates that successful organisations need more than an APQP manual on the shelf – they need to be doing Advanced Product Quality Planning with a management team that knows and understands how the process ‘adds value’ and is committed to using it. Only then can organisations start to improve and optimise the product development process, enabling innovative products to achieve their market potential and satisfy customer expectations for performance, reliability and durability. In addition, BywaterExcel’s Failure Mode & Effects Analysis course explores this powerful technique that enables companies to reduce product liability risk by anticipating and preventing defects in design and manufacture. For further details of these training courses or to learn more about how BywaterExcel can support your organisation, please visit our website www.bywaterexcel.co.uk.